Sounds are not often taught, and phonetics is a bugbear and source of fear amoung non-NESTS... but it is easy to do, and fun to do so. The vowels can be taught in under 15 minutes using the chart... so I hope this will be as useful for your students as it has been for mine. Pitter patter, let's get at her. I love pronunciation and I love hobbits. -a map for your tongue. It is also possible to connect Language 1 sounds with English. As I am in a Castillian Spanish atmosphere, something that the Spanish have difficulty with at a phonetic level is vowels. They don't have weak form (schwa), so ə and ɜ: are totally foreign. The quality of the vowels are different. 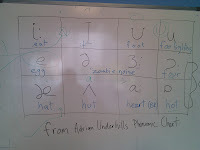 Of course, phonetic symbols are frightening and confusing out of context, and our job is not to bring unnecessary complication into the classroom. So... how do we look at this effectively? In walks Mr. Underhill's chart. Or at least part of it... the vowels. Then show the REAL sound by having them do a tongue slide from front /i:/ to /u:/ . /e/ being the same, go on to /a/, which is a tongue slide from /æ/ → /ʌ/ → /ɑ:/ on the bottom of your mouth. (Weak form is perhaps best seen on the Adrian Underhill video.) I have them make the sound that zombies make, (uhhhhhhh...) and change length. I point out that schwas are 30% of all vowels used, and that they are never stressed. Zombies don't yell. Underhill points out that while many coursebooks teach one sound today, another tomorrow, it is when they are together that they all sort each other out. Have the class follow your finger around the chart while making the sounds... it is fun, and they can suddenly make precise sounds they may not be even able to hear yet. 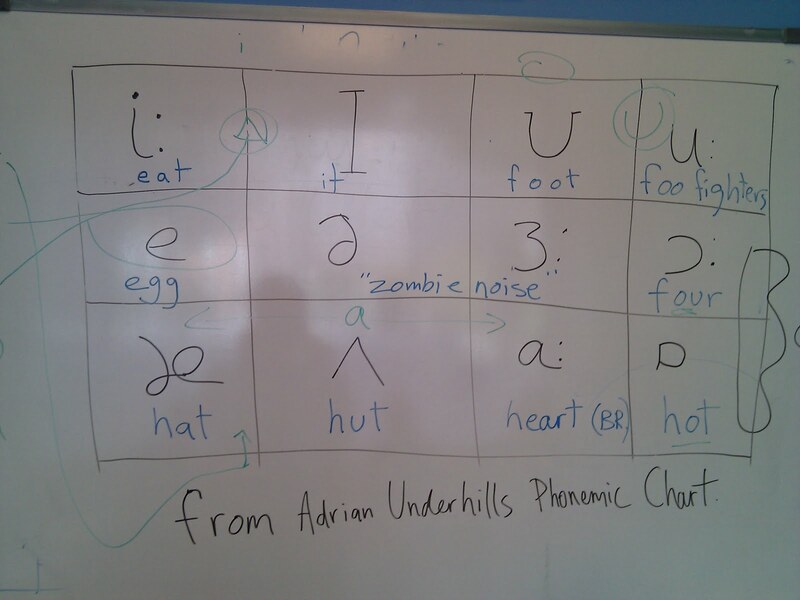 If the phonemic chart doesn't interest you there is always phonetics through juggling like in my show, "Perception and Deception". Cargado por mattledding. - Mira más vídeos divertidos.